-Comes from Greek: xanthos (yellow) and elasma (beaten metal plate). -Was described by Addison and Gall in 1851. -Is most often located around the eyes, mostly in the inner canthus. 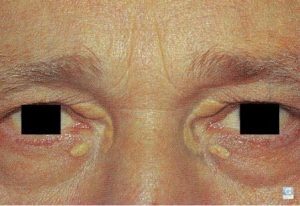 -It is a marker of elevated lipids 50% of the time. -Treatment includes surgical excision, laser therapy, chemical cautherization, electrodessication and cryotherapy.